January 29th, 2019 Be the First to Comment! Every Tuesday during ‘A Month of Self Love’ I have been sharing my personal ‘go-to’ self-love support tools because I am a big believer that what you ingest – whether that’s what you read, watch, listen to or swallow – contributes to your mental, emotional and physical health in equal measures. If you desire to love yourself more, I invite you to stop ingesting anything that doesn’t serve you or that lowers your vibration. I love to attend live events whenever I can whether it be a short workshop, a full day seminar, a dinner with inspirational speaker(s) or a retreat. The chance to immerse myself in the company of like-minded truth-seekers with a coach, speaker or teacher that I deeply trust and value is totally worth the time, money and energy. Today I would like to share some events I am attending this year and platforms that might offer events that could interest you too. My go-to platforms for inspirational events in the UK are Hay House and Alternatives. I’m on all sorts of mailing lists so am often hearing about inspirational events around the country as well as overseas retreats. I’ve yet to book in my full schedule of events to attend this year. At the moment I am booked to attend ‘Ignite’ on 13th April and ‘The Self Love Summit’ on 29th June – both in London. 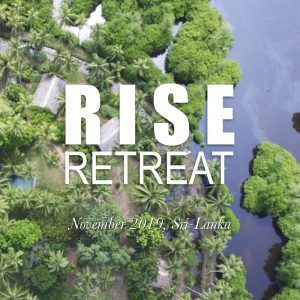 The School of Self Love will be hosting some events and retreats this year too, including The Rise Retreat in Sri-Lanka in November. There are only 6 spaces available so let me know ASAP if you want to snag your spot! Watch this space for additional retreats and events from The School of Self Love. I would love to see you there. So that wraps up today’s love note. I hope you are inspired to attend some live events and I hope to meet you at some of them! Here’s to an incredible 2019!